Even from the sidewalk, through the plate glass and deep inside Jenkins Johnson Gallery (464 Sutter St., S.F. www.jenkinsjohnsongallery.com), a pair of brightly colorful images may catch your eye. The exhibition “Spring Selections,” of which they are a part through May 12, is a nice enough showcase of gallery artists, but Wesaam Al-Badry’s photographs demand attention. Part of a new series called “Al Kouture,” they depict Muslim women in modified traditional garb. 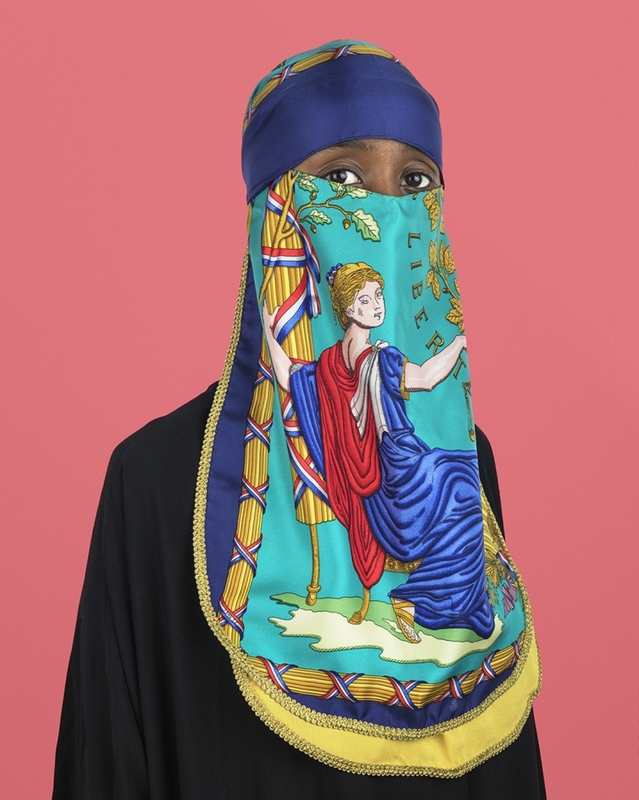 In this picture, the somber facial veil (niqab) is replaced by a gaudy Hermès scarf. The word “Liberty,” a fragment of the motto of the French Republic, and an image of Marianne, personification of French independence, alter a decorative motif into cultural critique.